When you view the video and story concerning what happened to Marcus Jeter of Bloomfield New Jersey you understand how out of control police are. The fact the courts defended the dishonest officers and their perjured stories exposes how bad things really are. Imagine going to prison for decades for a crime you did not commit. Getting a record and becoming a convicted felon. However because police and our courts are in bed with each other and so closely tied they won’t stop injustice. 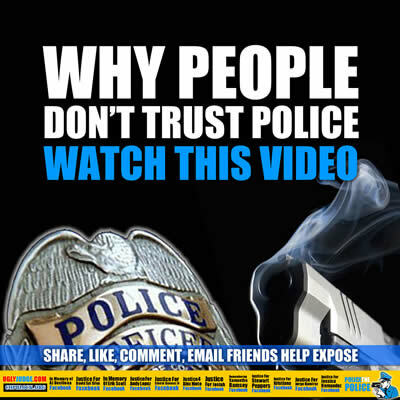 Lets not forget when police commit crimes our courts bend over backwards to give a totally dishonest cop a way out. Police don’t get records or become convicted felons, they retire. A dishonest way to keep their benefits, a way to get re-hired by other departments and a way to escape prosecution and punishment. No accountability, no transparency, no personal responsibility and no punishment. The same goes for judges and members of the court who commit crimes, when exposed or reported police rarely treat them the same as the public. Following Marcus Jeter’s arrest, Jeter alleges township police engaged in a “cover up” by creating false reports about the incident and withholding a second police dashboard video, the lawsuit states. Officer Orlando Trinidad, Officer Sean Courter were arraigned Friday in Superior Court in Newark on charges of conspiracy, official misconduct, tampering with public records and false swearing, Essex County prosecutors say. Trinidad also faces an aggravated assault charge. Both officers were indicted. They each pleaded not guilty and were released on their own recognizance after their court appearance Friday. Prosecutors say the charges stem from the June 2012 arrest of 30-year-old Marcus Jeter, of Bloomfield, on charges of eluding, resisting arrest and assaulting an officer by punching him in the face. Prosecutors dismissed charges against Jeter in April after an investigation, first reported by WABC-TV, turned up a dashboard video from one of two police cruisers that responded to the incident. “The charges are linked to the fact that a second video came to light during the course of this investigation,” said Katherine Carter, a spokeswoman for the Essex County Prosecutor’s Office. She declined to elaborate. Bloomfield police officials could not be reached for comment. Notice the officers are not in jail. Their also pleading NOT GUILTY. This scam is not over yet, the courts and police department will do all they can to all these criminals to avoid getting a record or being punished fully. Why is there no Accountability, Prosecution and Punishment of Police, Judges or government employees? Because the scam is NOT TO PUNISH them, to get the public to think they get punished. Yet bad judges keep their huge million dollar pensions and benefits which tax payers are forced to pay. Same goes for Police who keep their benefits and pensions, even if they’re guilty of crimes or murder. Think this is an isolated case? See Officer Ronald Reinhart Jr.
How many suspects did SF cops frame? 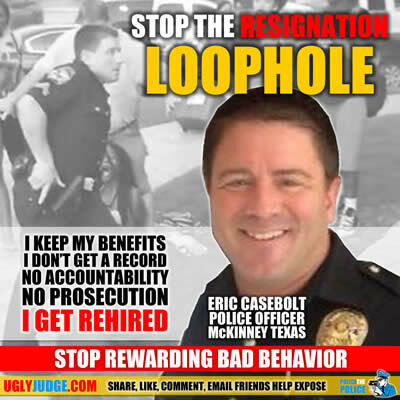 Remember this obvious bad officer below who resigned, instead of being fired. He’s is free to hide and when the heat dies down he gets hired again and keep his benefits. When non-Police folk do something wrong or commits crimes while on the job they’re fired and lose everything plus get a criminal record. In this case the tax payer pays Police a salary and when they commit crimes or do wrong.